Oracle BPM 12c is improved with a great installation process - simplified and stable. You only need to download single installation package, run a wizard and after several clicks it gets installed. All required products are installed for you out of the box, no extra configuration is needed - JDeveloper, BPM/SOA extensions, BPM/SOA schemas in Java DB. Developer can focus on his development tasks, no need to spend days to install and configure development environment. You should read official guide - Quick Start for Oracle Business Process Management Suite. Installer works on Mac OS platform, you can install entire Oracle BPM 12c infrastructure and run domain. However, it fails to open Human Task wizard, while running JDEV on Mac OS. 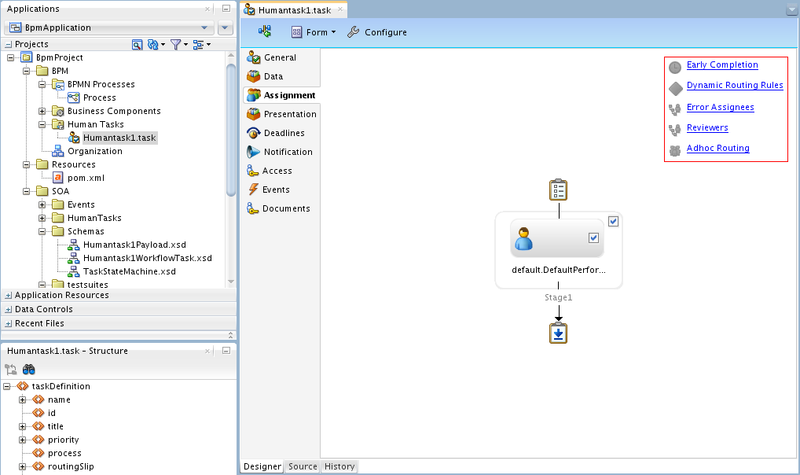 I have developed extremely basic Oracle BPM 12c sample application, to test Human Task wizard with JDeveloper installed on Oracle Enterprise Linux and on Mac OS - BpmApplication.zip. Probably you should not use Oracle BPM 12c for development on Mac OS, rather use Linux or Windows platforms. This is a bit pity, but on other hand JDeveloper extensions (except ADF Mobile) always had issues running on Mac OS. It should be no difference, but it seems like development on Linux or Windows with JDeveloper is more stable. Hi, good tip on the HumanTask editor for 12.1.3 - I thought I was going mad! You can still edit them in source view if you're comfortable doing that. 1. I can't seem to undeploy, it says the server isn't running. 2. When I try to test a service inside the Enterprise Manager, this doesn't work either, it says the WSDL is invalid. When you check back in JDev, there are no validation errors for the auto-generated servce WSDLs it refers to. 3. It makes my MacbookPro fan spin like a jet engine with no let up while the integrated WLS is running. At present I have found 12.1.3 to be unusable on my Mac due to these issues, switching to Linux. I have seen some of the issues you are mentioning. Actually, I'm using standalone server - it works better than integrated. 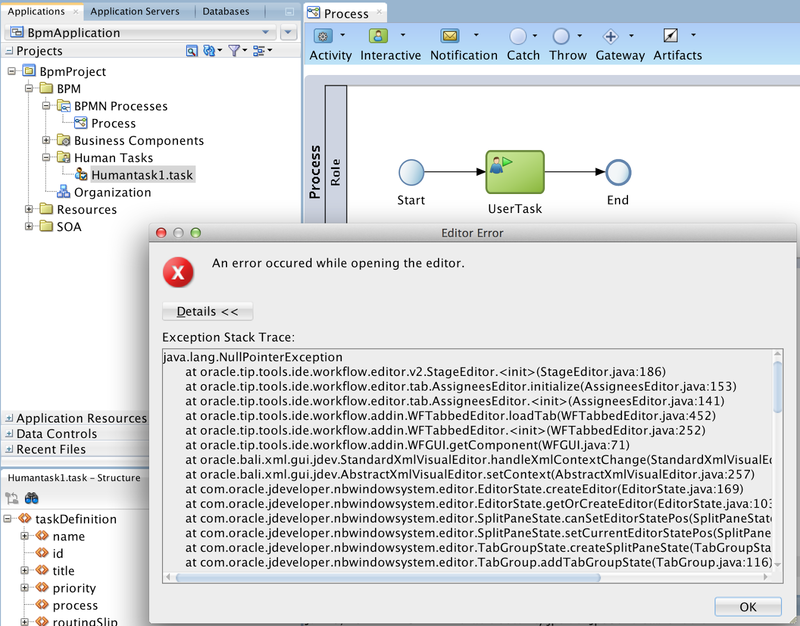 I am having the same issue running OSB 12c on my mac air with JDeveloper crashing all the time ! Guess theres lot of work to be done to improve jdeveloper performance ..
where/how can I get the patch? Hi Andrejus, thank you for all your valuable posts. 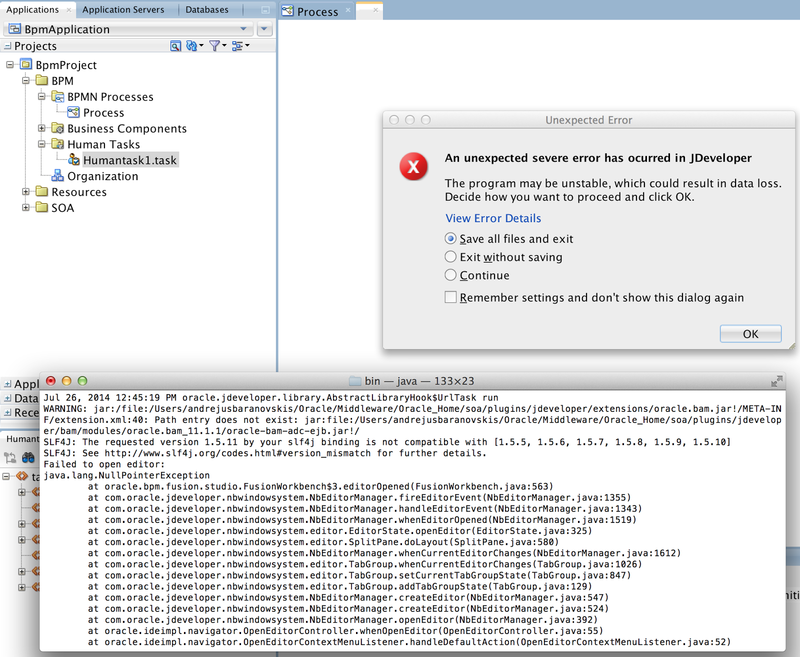 I'm trying to work on JDeveloper 12c (on Windows), against an Oracle BPM Suite 11g. I wonder if this is at all possible since I can't find the old "BPM-MDS Connection" and when trying to create a PAM Connection I get a "Connection Failed. BPM-0. Operation Failed" error. Oracle has made available the patch #19265102 for this issue on support.oracle.com. I've applied this patch and everything worked as expected. Yes, this is documented in comments above.